The Unis'tot'en clan of the Wet'suwet'en evicted surveyors who came to mark the path of the Pacific Trails Pipeline in Canada. "The Unis'tot'en clan has been dead-set against all pipelines slated to cross through their territories, which include PTP, Enbridge's Northern Gateway and many others." 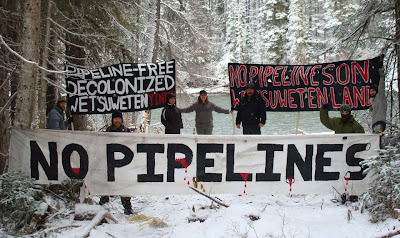 "Thousands of miles Northwest of the Tar Sands Blockade stands the Unis’tot’en Camp, where members of the grassroots Wet’suwet’en and their allies have established a resistance community directly in the path of the Northern Gateway and Pacific Trails Pipelines. The Unis’tot’en Camp stands in solidarity with the Tar Sands Blockade. We commend the courage and dedication of the dauntless eco-warriors of Texas. May our actions be in conjunction with yours."